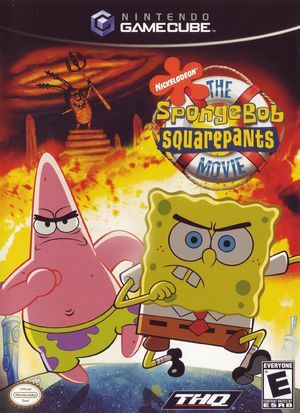 The SpongeBob SquarePants Movie is a video game based on the film of the same name. It was created on the same engine as SpongeBob SquarePants: Battle for Bikini Bottom. When you enter a "Freezer" type area (where you will see ice-cream, and ice around) the game will start making all sounds echo. Whenever the player talks (in this case Patrick) the voice will sound choppy/distorted, but once you exit the area then the effect will turn off, and the problem will go away as well. Even while using LLE the issue still persists, I tried it on my GC, but the audio all sounds the way it should. It is also notable that if you break any boxes/breakable objects it will cut off any other audio that is playing at the time (player lines, music, etc). On the level "Bubble Blowing Baby Hunt", a few raising platforms are invisible. They are still there, so it's possible to pass, however it requires you to jump onto these platforms with little idea as to where they stop, making it easy to fall into the lava below you. This isn't too big a problem, as springs underneath the invisible platforms are still present to show you where the middle of these platforms are. Anything that isn't in-game (meaning that it is just a video within the game) may turn black/blank. To fix this, set 'External Frame Buffer (XFB)' to 'Real'. Fixed with Hybrid XFB in 5.0-5874. On anything above 1x Anisotropic Filtering makes the ground glitch to rather large see through triangles, although it's not too noticeable and isn't anything to really take away from the gaming experience. On 1x Anisotropic Filtering this glitch is not present. In addition to the former, there is a transparent box in the upper-left hand corner of the screen (using OpenGL will have a small transparent line in place though), and other minor visual problems (flickering objects occasionally). This game has graphical glitches with higher internal resolutions including a box in the upper-left and messed up shadows that can be fixed with an AR Code. This game has clipping issues with the widescreen hack that can be fixed with a Gecko Code. The PAL (German) Version of this code was made by Ralf. The graph below charts the compatibility with The SpongeBob SquarePants Movie since Dolphin's 2.0 release, listing revisions only where a compatibility change occurred.